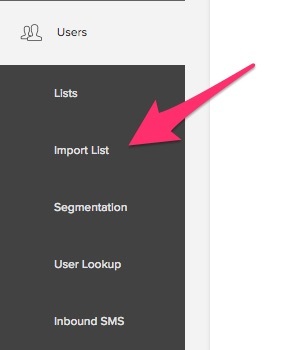 In Iterable, you can import user lists by selecting Users > Create List or by clicking Import List on the Users > Lists page. 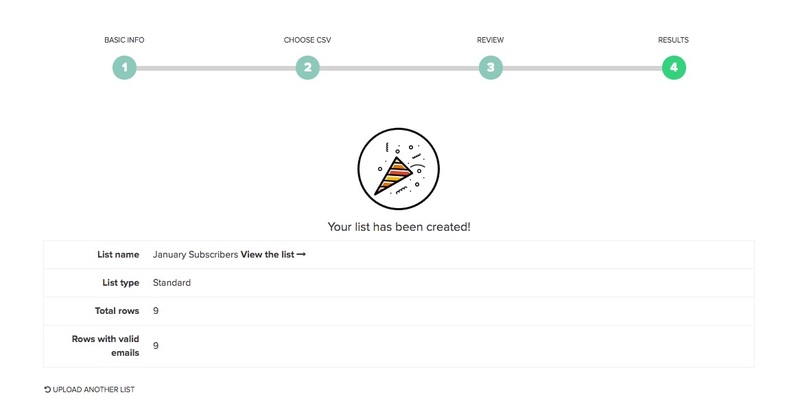 Create a Blank List With No Users - One use case for this would be if you wanted to include it in an Add to List action node of a workflow, where users would be added to the list after completing a certain path. 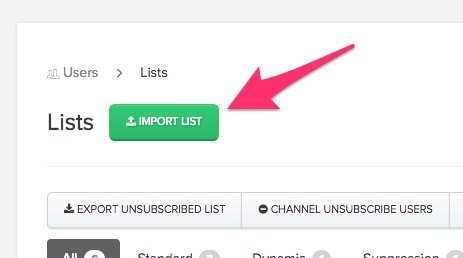 Update Existing Users Only - Any new users that are entered into the import list will be ignored. Drag and drop a CSV file into the window. Select a CSV file from your computer. Manually enter the list data. In order to import users via CSV upload, email is required. You will not be able to import users without email addresses. It is a best practice avoid leaving spaces between field names/values in the header and rows of your CSV and when manually typing in the data—especially for fields that are of type long. Once you click Next, you will be brought to the Review page and prompted to verify that all details of your list are correct. The Review page also shows you the new user fields that will be added to your Iterable project because of your CSV upload. You'll notice that this is the case for city and birthMonth above (green text to the right of New user fields to be added). Unless set in a specific format, new users fields are set as strings by default. 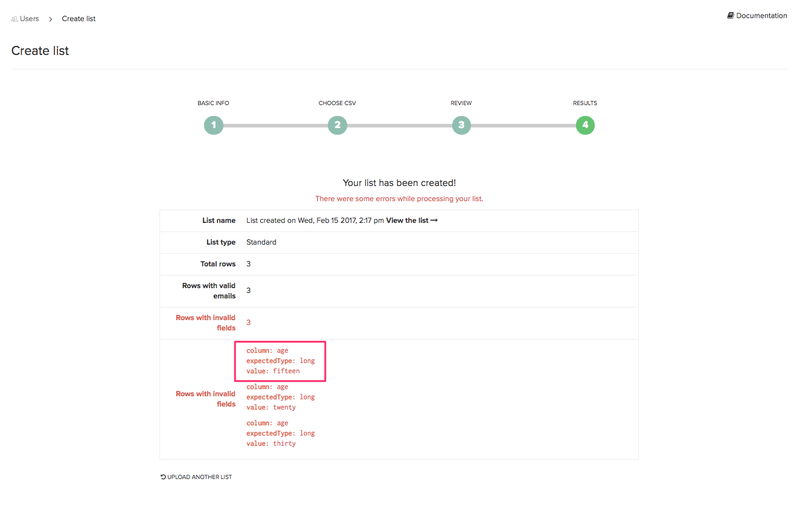 You can set three data types within the Create List page: string, boolean, and date. Dates should be in one of the following formats if setting via the UI: YYYY-MM-DD HH:MM:SS or YYYY-MM-DD. You will not be able to change the name or data type of user fields once they have been created. Once a user field is set as a certain type, it is permanently that type. You also can't delete user fields once they have been created. For more information on data field types, read Data field types in Iterable. If you try to upload a CSV with values that don't match the data types of existing user fields, your list will be created, but users with incorrect values will not be added to the list or created within your project. Only users with correct values will be added to the list and created if they don't already exist. Iterable shows you the number of rows with invalid fields and which values are incorrect. Users who do not meet Iterable's email validation requirements will also be dropped from the import. To learn about the best practices for CSV list import, read CSV list import best practices. 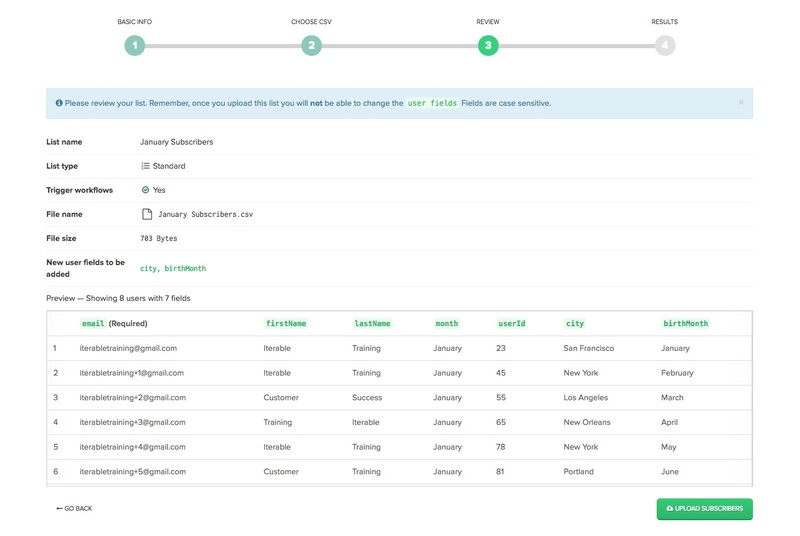 To learn about migrating subscribers from another email service via CSV uploads, read Migrating subscribers from another email service via CSV uploads. 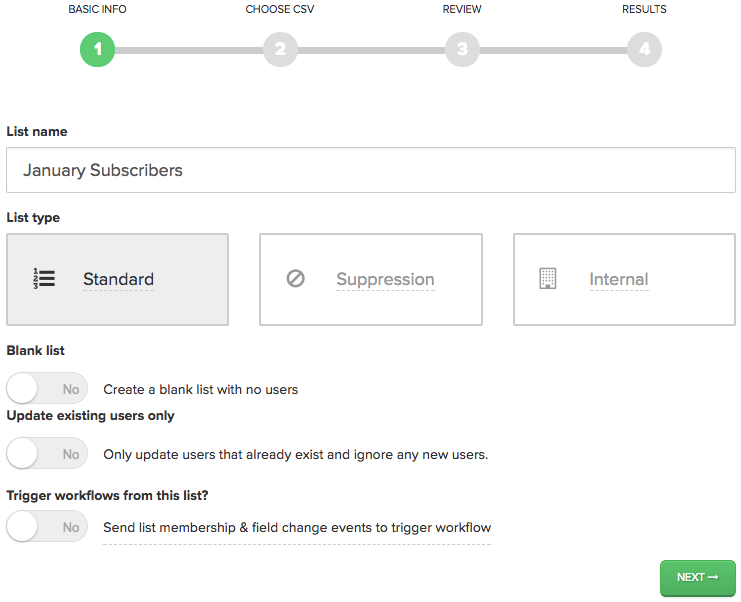 To add users to an existing list, navigate to Users > Lists. Find the list that you want to add to and then hover over it with your mouse cursor. An Add subscribers / Modify List option should appear. Click on that text to launch a screen similar to the one for new list imports. Follow the same instructions as above to add users to the selected list. Column names may not contain special characters. Using special characters in a column name will prevent users from being uploaded.